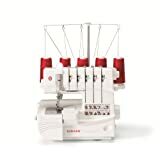 Looking for the best serger reviews? 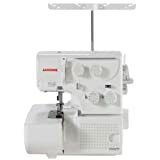 We’ve compiled our serger reviews here along with a handy serger comparison table. 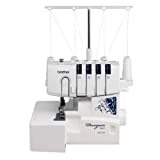 Having a great serger is a must for efficiently sewing professional level projects. 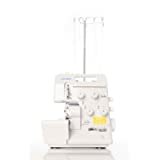 Sergers have so many features and some can be hard to tell whether a serger has manual tension, coverstitch capability, a free arm, if they’re rated highly or if they’re not worth the price…it’s a jungle out there! Thankfully we break it down in the following table for quick reference so you can purchase with confidence. 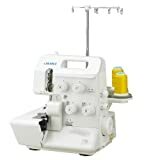 You can also see our Best Serger for a Beginner article for more insights. If you’re not sure about any of the terms used here a quick explanation is provided below the table. Number of Threads: Different sergers can do stitches with different numbers of threads. A 2 thread serger will create a basic simple edge. 3 thread will do a much better job of looking professional and preventing fraying edges. 4 thread will allow locked stitches and a nice wide strong seam. 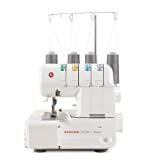 5 thread is by far the most adaptive serger but will cause a large price jump over a 4 thread and is unnecessary for most hobbyists. Stitches per Minute: Just as it says this is how fast the serger can stitch. Most beginner sergers are about 1300 stitches for minute. 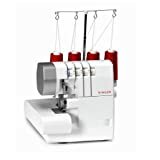 Tension: The tension on the thread is manually adjusted with a knob on a manual adjustment machine, while an automatic adjustment relieves the user from having to mess with it. 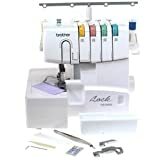 All entry level sergers have manual thread tension. Coverstitch: A type of stitch that forms a pattern that looks ladder-like. This is frequently used to complete hems of knit garments. Free Arm: A free arm allows you to extend out the area under the needle, making it much easier to work with curved pieces like cuffs and collars, or smaller sized items like children’s clothing.